BONNEVILLE, Ore. (AP) — A Labradoodle named Gracie fell 200 feet off a cliff in Oregon — and survived. Dog owner Michelle Simmons says Gracie and another dog were playing on a trail in the Columbia River Gorge. Gracie went over the side of the cliff. Simmons says they heard the dog rolling, heard her hit the ground and yelp — then nothing. They thought she was dead and began an impromptu memorial service. That’s when another hiker came rushing up, saying the dog was alive. The Oregon Humane Society’s volunteer technical rescue team responded. One member was lowered down to Gracie and fitted her with a harness early Monday and brought her to safety. KPTV reports (http://is.gd/qQdJAi ) that dog suffered only scratches and bruises in her fall off the steep trail. 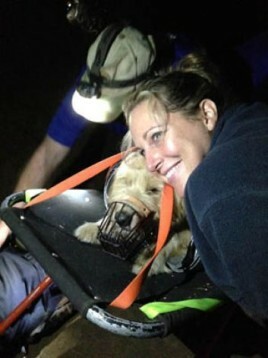 via Labradoodle survives fall off 200-foot cliff – SFGate.